Who doesn't love easy Valentines desserts? Take a look at our assortment of recipes for easy, festive and delicious desserts to make for Valentines Day! 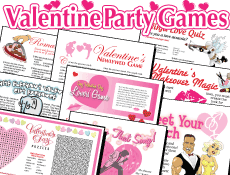 Perfect for Valentines Day parties at home, at school or even in the office and take it one step further and GIFT these treats to friends, family and neighbors using the cute printable tag you will find below. One of our family favorites to make is homebaked cookies. Years ago I found the best kept secret for homemade cookies. You can make, bake and decorate in under 30 minutes and they are absolutely fool proof. Years ago I found the best kept secret for homemade cookies. You can make, bake and decorate in under 30 minutes and they are absolutely fool proof. As the cookies are baking, get ready to decorate with pink, red and white frostings, Valentine MnMs, colorful decorating sugars, sprinkles, skittles, red hots and any other Valentine colored decorations. Your cookies will look beautiful and taste delicious. Once cooled, individually wrap your cookies in plastic wrap and pack in seasonal tins, Ziploc containers or goody bags tied with ribbon. Here's our tips to making the easiest homebaked cookies ever. Make sure you follow the baking tips.. one of the keys is Parchment paper. Once you take a look at all our yummy and easy Valentines desserts, choose your favorite and get baking! Then wrap them up and attach this cute Valentine Day poem tag and start playing Cupid as you spread the sweetness! Here is the free printable gift tag for these easy Valentines desserts. OR learn how to make this easy LIGHT UP Valentine card! Sweet Treats for Valentines Day.. recipes included! Our family LOVES cake pops! We make them for almost every celebration and they can easily be themed for any one of them. So pink and red and white ones for Valentines Day are a natural! The key is that we found the best shortcut ever - see how to make easy cake pops! You can make a dozen in 30 minutes and they come out perfect! Who doesn't love Rice Krispie treats? Look at these festive desserts for your Valentine celebration.. pink heart shaped krispie treats on a stick. Using food coloring turn the traditional rice krispie treats pink, mold into shape using heart shaped cookie cutter, dip in melted chocolate, add some sprinkles and you have a pretty and yummy dessert. Our favorite site for easy desserts for all celebrations is Messy Little Baker.. Stephanie has step by step instructions for making more easy Valentines treats ! Look at these super easy Valentines desserts.. they are frosted marshmallows on a stick! I can't take credit for this idea.. a really creative blog Mommy Gaga ( got to love that name), created them. So easy, 20 minutes start to finish! Just chill the marshmallows, dip in melted chocolate and add the decorations. There is a link at the bottom to her site where she has a step by step tutorial! Her best tip is that you have to use old fashioned paper straws or popsicle sticks. Plastic straws don't work. Amazon has the colorful Paper Straws here that work perfect or you may find them in right in your grocery. A fun Valentines Day activity the kids all love.. spread the love!